The initiative of senators who have proposed significant changes in the order of appeal, until the mixture is maintained. This initiative has also decided to discuss the sociological research center recruitment portal Superjob.ru. Namely, they decided to ask own respondents, intensive Russian people, users of the web, if they approved the initiative upper chambers of the Federal Assembly of the Russian Federation, which provides recruits themselves come to the military for subpoenas for 2-weeks since declared a regular call to military service. In case of no-show, the Senators threatened, they may incur criminal act under Article 328 of the Criminal Code ("Evasion of military and other civilian service"). According to information acquired by sociologists, approximately 61% of the respondents did not approve this idea. Many of them believe that "the state is necessary that the people he served, and not vice versa." In other words, Russian authorities should make the conditions applicable to young people to serve in the army, and not to engage in inventing new methods to fill the ranks of both employees and measures that would penalize those who have not received a summons for a reason. According to respondents, these measures are more "choice without a choice: army or prison. " In-1's, according to the respondents, it may happen that a person does not know that the law passed, and it turns out that in this case it is deviationist without their own knowledge. In-2, draft boards will be required to search for draft dodgers, which will be much more. The new rules call most men speak out (64%), respondents aged 45 years and older (64%) also surveyed citizens kazhdomesyachny whose income is between 35 and 45 thousand (64%). The number of participants in the survey, endorsing the draft regulations is 21%. According to the views of the respondents, such a measure will allow to increment the number of soldier in the Army, serves as a reminder of conscripts performing civilian duty. They believe that every able-bodied citizen must serve in the Armed Forces, the duty of giving their own country. For example, one respondent wrote that the need to increase the punishment for failure to appear, and eliminate various workarounds that allow recruits shy. Public awareness, encouraging such acts virtually protects the current draft dodgers from punishment. Not determine the answer 18% of the respondents. Many of the respondents believe that, on the one hand, every self-respecting muzhik have to serve in the army, and on the other hand, army is a matter for the volunteer. 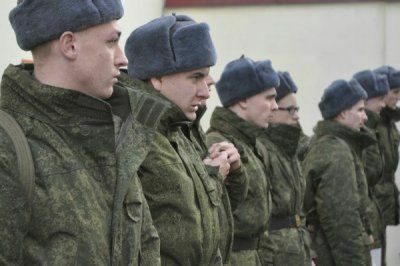 By the way, legislators, other than punitive measures developed amendments to the Russian Labor Code, in accordance with which the recruits will be saved for jobs for the duration of his service in the army. Here we have in mind as a work in municipal as well as on personal. This amendment — the so called "carrot" for the category of conscious people who personally came to the assembly point. To discuss these proposals, the Research Centre recruitment portal Superjob.ru decided to hold the next poll. However, in this time were asked only adult men who remain very "concerned" part of the audience. "Knut" Russians, the recruits did not approve. But our hard carrot to lure young people into the armed forces. Most of the respondents (64%) believes that the number of draft dodgers from similar measures will not decrease. Interviewees believe that there are many circumstances in which young people avoid military service, and measures relating to the preservation of jobs, not be forced to recruit him to leave for the sake of a gun and foot wraps. In addition, some respondents, taught by bitter experience, have expressed suspicion that negligent employers will still try to find a way to get around the law. According to the views of respondents in Russia almost half of commercial companies every two years, the process of re-registration or locked. They also they say that the deviators from the army, are not those who are afraid of losing job, and those who do not lust to serve in the army. In the middle of skeptical towards the initiative of the senators most boys between the ages of 28 to 37 years (68%) of the respondents also neprizyvnogo age who are not serving in the army (66%). Every fourth respondent is willing to argue with them: on the views of 24% of the respondents, the conservation workplace will be able to reduce the number of draft dodgers, provided honest fulfillment of its own obligations to employers recruit. Confidence in the midst of amendments proposed to the Federation Council, many respondents military age, not serving in the army, as those who are older than 27 years (27%). Difficult to answer 12% of study participants. They believe that if the thought of Senators and help, it is very nekordinalno. At the same time, men who had served in the army, believe that service did not have a negative impact on their future career. Three-quarters of respondents (75%) say with certainty that the service does not stop at the call of the prof. Specifically service in the army, in their opinion, helps to learn faster to work with people, only army gives the opportunity to learn to work in a team and with all with all this only rely on their own strength. Among those who believe that military service is not interrupted their prof growth, more of the older generation (83%). In contrast, 14% of respondents guys who served, thinking that the service prevented them masterfully realized. Does anyone not come to get an education, someone says with regret the missed during the life of Prof. experiences, some quite well and can not get a job after the army. Another 11% of the guys who know the taste of a soldier's porridge, found it difficult to say whether military service interrupted their career. It is possible that your idea senators will defend virtually "with a gun in his hand." Meanwhile, public opinion is clear on the other side of the legal fence.